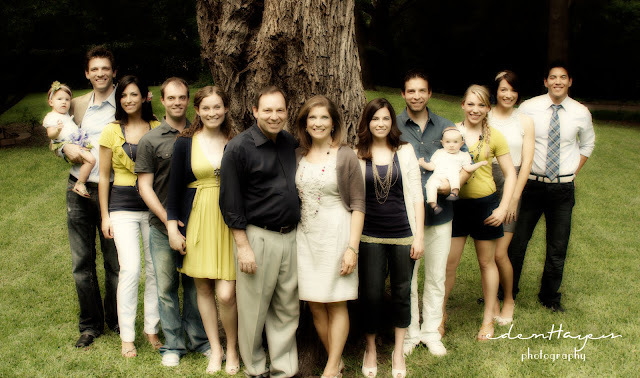 I was very excited about this family's shoot because, they're my family!!! This is my aunt and uncle with their 5 kids, 4 in-laws and two beautiful granddaughters. They all came in for their 30th wedding anniversary. I am so thankful for such a wonderful aunt and uncle (plus the cousins too), words really can't describe the blessing they are to me. Love you guys!!!! SO cute!! I told Austin that you were going to have SO much fun with this one because they were all dressed SO perfectly :) I can't wait to see more! What a GREAT picture!!! Good job Aims!! !